How Does God Feel Toward Believers? 168. That’s how many hours we all have in a week. If you average 8 hours a night for sleep, it leaves you with 112 waking-hours. In that amount of time, you could do a lot of things. Like: make 12,320 vinyl records, quilt 5.5 quilts or read the entire Bible roughly 1.6 times. Needless to say, we all have a lot of time in life. Yet, the most common complaint is, “There’s not enough time in the day.” I’m guilty of this complaint, and it is usually an excuse for my poor planning. The issue at hand is that we don’t schedule and prioritize our time according to our life vision and goals. When the way we spend our time reflects what we ultimately want to achieve in life, we don’t feel aimless and distracted, our morale is built up by a sense of achievement, and strain is reduced on our relationships. While laying out my schedule, I am forced to evaluate which activities are really important to me. Once I prioritize my activities, I find my schedule to be full, but with gaping holes. How can this be? I ay out everything I wanted to do, but there is always still lots of time open.This makes it a great idea to make small tweaks to your schedule at least once a month. Life will seem tiresome (Eccl. 1:5-8). Life will seem unfulfilling (Eccl. 1:8b-9a). Life will seem uncontrollable (Eccl. 1:15). Life will be simplified (prioritized). Motivation will increase (achieving tasks increases motivation). Wunderlist – This app is amazing. It’s the best to-do list app I’ve ever used. Day planner – Don’t own a good computer or a ‘smart phone’? There’s always the good ole fashioned pen and paper. While I haven’t used this method myself, I have heard others say they have planned their weeks this way for decades. Some prefer it over digital planners. If you can stick to your schedule at least 75% of the time you have made a huge success. At the end of every believer’s life, they will stand before Christ and their works will be judged. All of their actions will be laid out on the table and they will be rewarded according to them. This judgement seat is not the same as the Great White Throne judgement, where sinners are cast into the eternal lake of fire, but it is still equally devastating. At this judgment seat, our salvation is not on the line, but our rewards are. In that day, some will feel deep sorrow and regret for the life they squandered and choices they made. Regret on that day will be a terrible, irreversible pain. I know I have done things I regret. So has your mother and father, your best friend, your doctor – and I’m sure, you. Life is full of things we wish we could undo: a sarcastic remark that hurt a friend, a bad thought or action, even regrets of not doing enough good. It would be nice if life had an undo button, but it doesn’t. The cold, stark reality is that our choices and actions affect us. There is, of course, forgiveness, but there are still repercussions to our actions. Take King David for example: his sin with Bathsheba was forgiven, but his illegitimate child still died as a consequence. How can a person live without regret? Write down your life vision/goals. We must view our lives as a whole, not just as a collection of here-and-now moments. When we write down our life vision and goals, our life becomes focused. The way we spend our time must fall in line with the vision. Plan your day-to-day, week-to-week schedule. Our life vision is meaningless if it doesn’t transcend from paper into our day-to-day life. 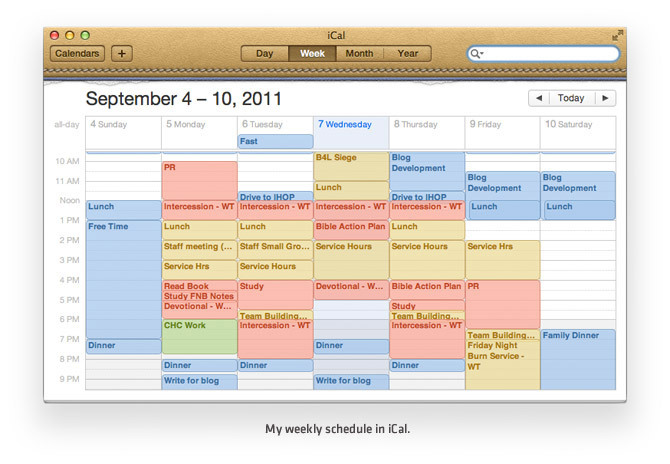 iCal or Google Calendar are great tools to plan your day in 15-30 min segments. Get a weekly routine going and stick with it. You’ll find that you have so much time that you’ll have to intentionally think What do I want to do with all this extra time? Get it into your head: Your actions matter! We must live intentionally and not frivolously spend our time. If you think you can do whatever you want whenever you want and ‘figure life out’ later, then you’re in for a sad wake-up call! Side note: while life is not a problem to be solved, but an adventure to be lived, we should still intentionally set up time-boundaries so we can maximize the adventure of life. 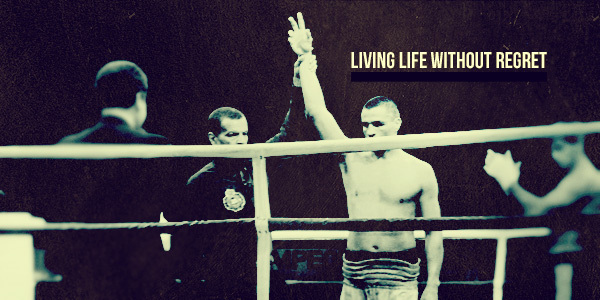 We only have one life to live – why squander it? We must stop living life as if we have an undo button – we don’t! We only have reward or regret. Make the right choice. The question what are we created for has stuck with man-kind since the beginning of time. Our obvious meaning for existence is to glorify God. The Westminster Shorter Catechism states it best: “What is the chief end of man?” And, in response, “Man’s chief end is to glorify God, and to enjoy him forever.” They understood that glorifying God and enjoying Him were one in the same. What if enjoying God was the greatest way to glorify Him? In my own experience, I had previously viewed enjoying God as an added bonus to the true duty of a believer: rigorous obedience to Christian duties (eg. praying, evangelizing, serving), even if those duties are emotionless, loveless. But what does Jesus say? “If anyone loves Me, he will keep My word" (Jn. 14:23). Love (delight) and obedience are directly related. Delight is not just a spin-off of obedience to God, but it is part of it. The strongest type of obedience is affection-based obedience. The concept of seeking to find our delight in God as a primary goal of a believer is not a new idea. It goes back to Moses who said, “Because you did not serve the Lord your God with joy and a glad heart…therefore you shall serve your enemies” (Deut. 28:47-48). And to king David, who prayed, “Satisfy us in the morning with Your lovingkindness, that we may…be glad all our days” (Ps. 90:14); and who promised that complete and lasting pleasure is found in God alone: “In Your presence is fullness of joy; In Your right hand there are pleasures forever” (Ps. 16:11). Even Jesus understood that delight is an essential part of a believer’s duty. Jesus said, “I have spoken to you so that My joy may be in you, and that your joy may be made full” (Jn. 15:11); Jesus even endured the cross “for the joy set before Him” (Heb. 12:2). When our aim is to find our pleasure in God, worship becomes a motivated response of love upon seeing the beauty of God. It is a feast to our spirits and a delight to our souls. Money – America spends a lot of money on our own pursuit of pleasure. 10.5 billion dollars was spent last year on movies alone. Apple Inc’s annual revenue in 2009 was 42.9 billion (a majority of that is mobile devices). It’s clear that we seek our own pleasure as a primary goal in life. But when our primary pleasure is found and satisfied in God, our seeking of other pleasures lessons. We spend our money on entertainment because we are attempting to fill a desire for God. When God is our source of delight, we don’t need to attempt to fill that desire with entertainment. Relationships – God designed our relationships to be a partnership of support and encouragement in life. Not the source of life. The problem with seeking pleasure outside of God – in regards to relationships – is that we think the other person can fulfill us, and they’re thinking the same thing. Broken hearts, shattered dreams and disillusioned hopes are sure to follow. Seeking our delight in God as a primary focus in life causes our relationships to take their proper place: as a mutual partnership of helpers. To be clear: I do not mean that our happiness is the highest good. I mean that pursuing the highest good will always result in our greatest happiness in the end. We should not make a god out of our seeking of delight. But in reality, we make a god out of what we take most pleasure in. That ‘god’ should be God. What do you think: Is God most glorified in us when we are most satisfied in Him? One of the most misunderstood verses in the Bible for me has always been Psalm 37:4 “Delight yourself also in the Lord, And He shall give you the desires of your heart." It just means God will give you what you want at the right time, DUH. While some of that may have some truth – God definitely does give good gifts to us – it is missing the mark. I think the main problem is in the phrase what you want. What do I want? Currently, I want to move out, start a Bible-study and get married, etc in the next 5 years. But if I think that Ps. 37:4 is only talking about what I want, then I’ve missed the mark again. A want is much different than a desire. A want is the 10% of the iceberg that is visible, while a desire is the 90% hidden beneath the murky ocean of my heart, mind, soul. Every single want could have up to five desires hidden behind them. Why do I want to move out? Because I desire independence, greater accountability, growth, maturity, first step to other desires. Want isn’t possible without desire. Every day our desires affect our wants which affects how we act, what choices we make, and who we decide to be. The friends we choose to be close with, the job we take, the way we spend our free time – all of these reflect our desires; yet it’s common to feel unattached to our desires and have almost no idea what it is we really want. Our struggles with sin and addictions are rooted in desire. Most of the time we sin cause we feel the need to fill a lack. A kid who spends 5 hours a day playing video games desires adventure; a person with an eating disorder feels the desire for love quenched by rejection, the desire to be beautiful and accepted; a girl who spends her time in abusive relationships desires to quell the rejection of her neglecting father or other relationship. These carnal fleshly sins are manifestions of deep, legitimate desires. Of course, there are some sins that are from rebellious, hard hearts, but I believe a lot of sins are from misplaced desire. Does that mean that desire is bad? I think the church in the West would jump to the conclusion yes! Desire gets me into trouble, I need to avoid it at all costs. Yet I would argue that unowned desire is what gets us in trouble. When we don’t understand what our desires our and when we don’t ‘own them’ we are controlled by them. Take time to look into your sins as well as your wants to find your desires. We cannot repent of our desires, they are God-given and legitimate, but we can repent of seeking to fulfill them in the wrong way. Let God show you what desires He’s placed in you and own them. Don’t be controlled by them. Live your life fueled by desire under control and guided by God’s Word. Copyright © 2019 Evan and Sarah Olsen. Site by Evan Olsen.